Alex also made a website! Check it out at AntarcticaRevisited.com where she included all sorts of activities for this expedition. A Weddell seal near McMurdo Station, Antarctica (Photo by Alex Eilers) The team traveled daily to Weddell seal haul out sites on the sea ice near McMurdo Station. While on location, the team found female seals, gently sedated them, and took a variety of biological samples – weight, size (length and girth), took blood samples, and collected tissue samples. They also took thermal images of the seals to see how much heat the seal was losing to the environment. A time-depth recorder also was placed on the seals hind flipper to record the seals' dive behaviors. The team will return the next season in an attempt to relocate the seals, take biological data, collect the tags, and determine if the seals have pupped. This data was collected and analyzed in an attempt to learn more about what drives the timing of a seal's critical life history events – such as breeding and molting – and how disruptions in that natural cycle by changes in climate and environment might affect the world's southernmost mammal. McMurdo Station, Antarctica (Photo by Robin Ellwood) While in Antarctica, the research team lived at McMurdo Station, the U.S. Antarctic Science Center. 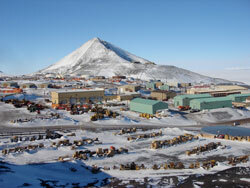 McMurdo Station is capable of housing up to 1,258 residents, the largest community in Antarctica. McMurdo Station is on Ross Island, a volcanic island (with the southernmost active volcano, Mt. Erebus) south of New Zealand in the Ross Sea. McMurdo Station has its own science labs, engineering centers, dormitories, galley (kitchen), and even a US post office. Article about UAA graduate students Roxanne Beltran and Amy Kirkham, part of the team studying Weddell seals in the Ross Sea. 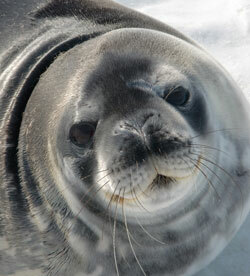 This one hour webinar features Alex Eilers and the team studying Weddell Seals in the Ross Sea. The team shares their research with the audience and honors the importance of Antarctica Day. The event celebrates the international treaty stating that Antarctica is set aside for peaceful scientific purposes. Article in the Shelby Sun Times about PolarTREC teacher Alex Eilers’ return expedition to study Weddell seals in the Ross Sea. Article about PolarTREC teacher Alex Eilers’ return expedition to study Weddell seals in the Ross Sea. Online article in the Bartlett Express about PolarTREC teacher Alex Eilers’ return expedition to study Weddell seals in the Ross Sea. Are there any hot springs in Antarctica that could be used to heat a biodome or melt ice for drinking water year-round?